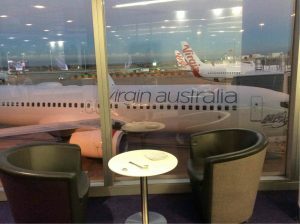 The next stage of the V Australia Boeing 777 Delivery Flight mission comes from The Lounge at Melbourne Airport; I didn’t even need a tie, just a $199 salary-sacrificed deduction for the year. Since the bus dropped me here at 5:05 am and I was checked in and ready to go at 5:10 for a 7:00 am flight – brekky, the paper and some work on the laptop is in order. Currently, I’m working on Day Two of the Phase One recurrent simulator training program for Primary Crew. Perhaps a magazine or The Age. Before leaving home, at the last minute I popped back inside and grabbed a tie (how pathetically hopeful am I?) you never know when that upgrade might come along. The taxi 5 minutes early, the lady driver friendly and efficient – I love Geelong! After a week of high temperatures (including a memorable 44.8 degrees with rolling power failures all week) it’s 18° and raining as I load my case in the boot of the taxi. On a whim, I make one last (nervous) check of my passport and ticket before closing the boot. The Gull bus driver is his usual taciturn self, refusing to allow me my carry-on bag on the bus – it has to go in the trailer. The usual eclectic mix of passengers to Melbourne Airport on the mostly empty bus (what else can you expect at 4 am?). While waiting on the bus for it to leave I look down the street, my sight attracted by the flashing red and blue of some sort of emergency vehicle – Ambulance? Fire Truck? As I watch I’m startled by a loud bang and shower of sparks all over the road from a transformer exploding (twice) as the street and the surrounding residential area is momentarily brightly lit before being plunged into darkness. Five minutes pass and the first blue and red flashing vehicle is joined by another. I guess I’ll never know what that was all about, but it certainly served to fill in the time. It’s hard to keep my eyes open on the bus, hopefully the driver isn’t having the same problem. I wonder how often my passengers think that of me? I manage about 20 minutes of kip and wake to hear the driver sharing the news of the road over the radio to others of his ilk. Apparently, there are now several SES vehicles back at the bus depot. I wonder what the first one was doing there, before the transformer went kaput? Check-in complete and almost two hours to wait for the flight. I’ve requested the jump seat, something I usually do. I haven’t been near the front seat of a plane since May, and sitting on the flight deck and watching others do it helps keep my hand in, in a strange envious but not sort of way. Also, there’s more leg room (sort of). And I sometimes get a free bottle of water. Next will be boarding for the (hopefully) jump seat to Sydney and the transfer to International for the Air New Zealand flight to Auckland. Fush and Chups anyone? Hopefully, I can connect in Sydney or Auckland, prior to the big one across the Pacific to keep posting. No sheep jokes, I promise.